I'd arrived too late to catch the first few bands, so the first one I saw was Majesty. I hadn't realised how much they were trying to be Manowar until this show. Of course, that's no bad thing in my book, but still, they were practically clones (although the singer doesn't have as good a voice as Eric Adams). Steel Tormentor weren't bad, but not were they particularly memorable. They did have some nice Maiden-like guitar harmonies in places, though. I'd been looking forward to seeing Savage Circus. I'd long been a fan of Persuader, and liked the Savage Circus material, too. Sadly, while it was a good performance, it wasn't a great one. The mix was awful, with the drums and bass drowning out much of the rest of the band, and although he has a great voice, Jens lacks charisma on stage. Highlights for me were "Tomorrowland" and "When hell awakes". I'd never heard of Eden before. They turned out to be a reasonable hard rock/blues band. The singer has an amazing voice, though. I'd been a fan of Axel Ruli Pell since his mid-'90s albums with Jeff Scott Soto, and had been looking forward to seeing him live. 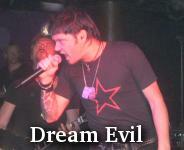 He didn't disappoint, playing a strong set, with Johnny Gioeli's vocals complimenting the band nicely. 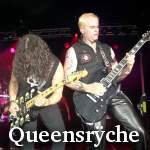 "Mystica" and "Temple of the king" were the standout tracks. 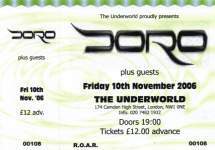 I'd been given a demo CD of To-Mera one night at The Peel, so I knew what to expect here. They seemed to have toned down some of the jazz parts for their live show, which was probably a wise move. The sound wasn't great, but "Blood" and "Born of ashes" still came across well. 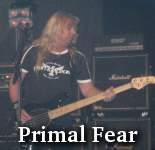 Primal Fear were the highlight of the first ever Bloodstock, and had put on another excellent performance in 2004. This was their third appearance at the festival, and they were playing on the back of their strongest album in a while, "Seven seals". 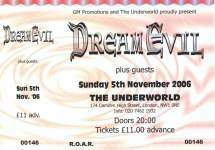 From that album, we saw "Demons and angels", "Rollercoaster" and the title track, as well as classics like "Nuclear fire" and "Angel in black". But for whatever reason, the crowd atmosphere just wasn't there this year, which took the shine of the performance a bit. 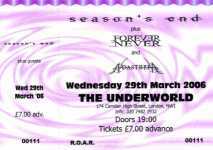 After initially seeing Adastreia supporting Season's End at the start of the year, I'd managed to miss their sets at their next two shows at The Underworld and The Peel. Tonight, however, I arrived in time to catch them. They bill themselves as female fronted black metal, but to be honest, I haven't seen much evidence of the "black metal" bit to date, either live or on their studio output. However, this evening there were definitely signs that they were heading in that direction, particularly on the new material, which is sounding very promising. My only real complaint would be the vocals. Alexandra has a stunning voice, but I'm not 100% convinced that it fits the music here, at least without something extra. Perhaps the addition of some harsh vocals to provide some balance would help. Still, I like the band, and they put on a decent live performance. Liquid Sky had impressed me no end when I saw them at FVOM last year, so I was looking forward to their set here, and they didn't disappoint. 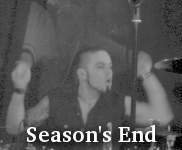 I've grown so used to seeing Jon with Season's End that it seems strange seeing him here, despite Liquid Sky being nominally his main band. 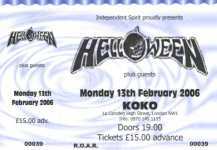 They were heavier than I remembered, and despite Hecate's vocals being mixed a little too low, put on another strong showing. I was a little disappointed that they didn't have any studio recordings available on the merchandise stall. Xandria had underwhelmed me on CD. Their music just seemed to be bland an ininspiring. I'd really turned up to see the two support bands. 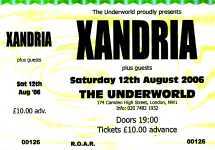 However, I was pleasantly surprised when Xandria proved to be much heavier and more intense live. Lisa's voice spanned the complete range from traditional clean vocals, through a Shakespeare's Sister like crone voice, to the occasional full on black vocals. Quite impressive. However, ultimately, they were still a little less enthralling than the two supports. 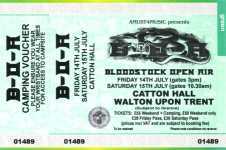 I'd missed last year's inaugural Bloodstock Open Air, as the dates conflicted with my racing, so I wasn't entirely sure what to expect. The site itself was well hidden, and the signs to it were not as obvious as they could be. But I arrived in plenty of time. The site was, as you might expect, basically just a large field with a stage at one side, and stalls around the edge selling a variety of products. Oh, and non-stop, baking hot sun. Unpleasantly hot, in fact. But I suppose it's probably better than rain. The first band up was Pyramaze. I'd never heard of them before, but the vocalist looked familiar. It turns out he used to be in Balance Of Power. They weren't bad, but they were a bit too proggy for my tastes, and lacking bite. Rage, on the other hand, were much better. That wasn't entirely a surprise, as they've always been very strong when I've seen them before. They concentrated mostly on material from their new album, "Speak of the dead", which isn't quite up to the same standard as their other recent work. But nonetheless, it was well presented here, and of course, there was a selection of their other material, as well. Highlights for me were "Down", "Human metal", "Don't fear the winter", and an excellent "Higher than the sky". Nephwrack played quite a reasonable brand of metal, mixing clean and harsh vocals. If I had a complaint, it would be that the vocals were sometimes a bit shouty and monotonous. But overall, an enjoyable set. 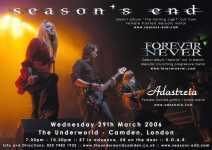 Nocturnal Rites had put on a good show supporting Saxon a few years back. But here they were just too bland. They still have a high quality back catalogue to plunder, but they just didn't perform as well as I know they can, and were a big disappointment. Pitiful Reign had been getting a lot of good press on the Bloodstock forum before the show, so I was hoping for good things. Sadly, it seems that it was all hype. They played straight ahead thrash, but nothing that particular stood out, and certainly nothing that justified their reputation. I hadn't expected them to be so young, either, but it does give them plenty of time to grow, so perhaps in a couple of years they'll have improved. Atheist were one of those bands that I never really rated back in the day, and it's easy to see why from their performance here. They're very good technically, and are obviously skilled musicians. But the songs are just lacking melody, which combined with the terrible screechy vocals just didn't make for an enjoyable set. 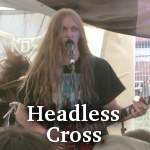 Headless Cross were another much hyped thrash band. Unlike Pitiful Reign, however, they were actually quite promising. Again, nothing outstanding, but there's definitely potential there. Kingsize Blues once again showed no evidence of playing any blues. They did, however, play a pretty reasonable thrash inspired set, with some excellent musicainship. They were let down by the shouty vocals, though. If they'd just get a vocalist that would sing, they'd be a much more interesting proposition. They were better than the last time I saw them, though. Metal Church always remind me of my friend Luke, who used to listed to them 15 or 20 years ago. To be honest, I hadn't really heard any of their music since that time, so I wasn't sure what to expect. The answer was a solid slab of traditional metal, which was very much welcome, and went down well with the crowd. 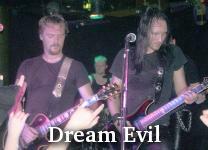 Headlining the second stage were Evile, the third of the UK thrash bands that had been hyped on the Bloodstock forum beforehand. Once again, though, they didn't live up to the hype, sounding mostly fairly medioctre. I'd say they were better than Pitiful Reign, but not as good as Headless Cross. All three deserve congratulations for reviving the traditional thrash sound, but none of them really pulled it off as well as they should have done. 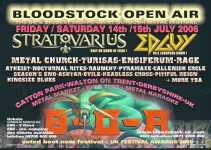 Headliners Edguy were playing Bloodstock once again, for I think the 4th year in a row. Much as I like the band, I was a little surprised when they were announced as playing yet again. This time, they brought their full European stage set with them, which included a large gargoyle with extending wings. As you might expect, they put on another good show, but one that wasn't quite as good as the previous times I'd seen them. In particular, Tobi and Jens were way too low in the mix, and could barely be heard at times. Moving further away from the stage seemed to improve the sound, though, which helped. 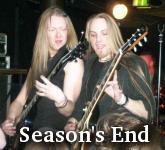 Highlights for me were "Mysteria", "King of fools" and "Avantasia". I arrived too late to catch Trauma Pet, so Swarf were the first band of the evening for me. I'd seen them many years ago, and had been impressed. Tonight, they played a sort of ambient electro-goth. Inoffensive, but not particularly engaging, either. I'd remembered them as being much more upbeat, and with stronger, more aggressive songs. Is it even the same Swarf, or just a different band with the same name? I don't know. But this Swarf were not really doing it for me. Manuskript were pretty much what I expected. The difference this time, though, was that Christian had been unleashed! He seemed to be playing much more aggressively than normal, with a harsher, more metallic sound to his guitar. For me, it was a definite improvement, although it prompted Mike to point him in the direction of Download. The new material is sounding strong, and they added in a cover of "It's a sin" for good measure. When I first saw Roadstar, they were called Hurricane Party. 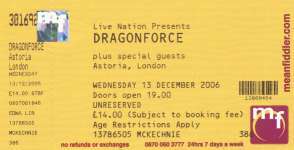 Indeed, they were supporting Queensrÿche at the time. But they were a bit of a joke. They had plenty of on stage enthusiasm, but showed little in the way of musical talent. What a difference a few years of hard touring have made. The band now seem confident and assured on stage, and the material has noticably improved, too. They've transformed themselves from a band I'd tolerate seeing as a support to someone else into a band that I'll now go out of my way to see in their own right. An excellent start to the evening. 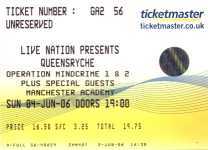 This show was the only UK date for Queensrÿche on this tour, so a trek up to Manchester was necessary. Normally, I wouldn't have bothered. Much as I like the band, it's a long way to go, and I've seen them several times before. 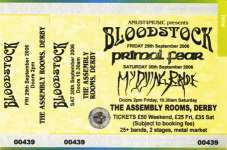 However, this tour was billed as having the band play the whole of the Operation:Mindcrime albums back to back. It was readily apparent just from the door times that they wouldn't be doing that at this show, as there simply wasn't enough time. That said, they did still play a significant subset of those two albums, in order, along with the accompanying stage theatrics. New guitarist Mike Stone now seems to be settling in well, and looks much more at home in the band than did his predecessor Kelly Gray. The sound was excellent, the songs were naturally strong, and it was great to see the Mindcrime material performed on stage. Highlight for me from the main set was "Eyes of a stranger". For the encore, the band played "Empire" and "Jet city woman", both of which were outstanding. They looked as if they were planning a final song, and there were rumours it was to be "Queen of the reich", but the appeared to be told that they'd reached the curfew for the night, and so it never appeared. But it didn't matter. The rest of the evening was easily strong enough to stand on its own merits. We arrived at the venue 15 minutes before the published door opening time, only to find that the opening two bands had already played. This was particularly galling as I was hoping to see Adastreia again, and I'd heard good things about Opus, too. 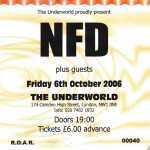 So it was that N.F.D. were the first band of the evening for me. They're a band that are quite consistently average. It's not that there's anything wrong with them, and indeed they come across as very professional and experienced on stage. But they just don't seem to have the songs to rise above that to a higher level. 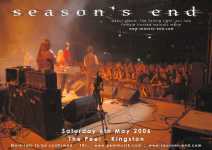 Season's End, on the other hand, are an outstanding live band. Tonight was not one of their better performances, and they seemed a little lacklustre compared to previous outings. Even when they're not on top form, though, they still put on a good live show, and the obvious highlight of "Ghost in my emotion" was always going to go down well with the crowd. Blitzkrieg were one of the original NWOBHM bands, most famous for their eponymous single, as covered by Metallica on their debut album. 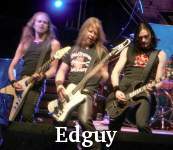 After a long period of inactivity, they resurfaced in the mid '90s, and although they have put out a few albums intermittently since then, the world hasn't paid much notice. However, there has been a fair amount of buzz about their most recent album, and they seem to be raising their profile somewhat. In truth, they were nothing special tonight. The vocals are clear and strong, and they have a good guitarist. However, they lack stage presence. Perhaps that's just because they're a bit rusty and will improve over time. The songs are well written, though, and they put in a reasonable performance. 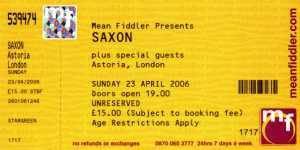 This was billed as a "back to the '80s" tour, and Saxon would only be playing songs from their albums released in that decade. Since that's where most of their strongest material is to be found, that was a popular move with the crowd. That said, they did make a single exception. Because it was St. George's day, they also played "Crusader", which went down well. Other highlights were "Strong arm of the law", "Princess of the night" and "Denim and leather". Aside from the highlights, though, the overall quality was down on previous performances, I thought. Not bad, but they can do better. 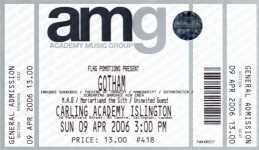 I hadn't been to Gotham for a few years, but my friend Tim was playing this year, so I thought I'd go along. I missed the first few bands, so the first one I saw was M.A.B. I'd heard the name before, but didn't know what they sounded like. They're an all female band, with quirky vocals, varying from operatic to punky. Somehow they remind me musically of Rockbitch. Interesting initially, but rapidly becoming a bit tedious. Screaming Banshee Air Crew were much better. Very much towards the more rock side of the goth genre, and quite accomplished and seemingly at home in a live environment. Providing today's dose of Spin̈al Täp were Norway's Gothminister. All of the goth clichés on stage in one place. The white face paint. The cross. The skulls. The top hat. Gothminister had it all. And more. Winners of the most bizarre stage prop award, they featured a goth step ladder. Actually, though, they were surprisingly good. The music had a Rammstein-like stomp in places. The vocals occasionally veered a bit too much towards the shouty end of the spectrum, but that aside, I found myself enjoying their set. 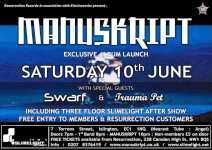 Next up were Manuskript. They got off to a terrible start, when Tim's keyboard completely failed, and stayed dead for the first song and a half. Also, Christian's guitars were also barely audible, but despite that, they still put on a respectable performance, and had some notable highlights, like "Lima". But they've certainly been better in the past. Theatre Of Tragedy were just dull. 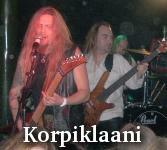 Their new vocalist is competent enough, but her voice just isn't as distinctive as her predecessor, Liv Kristine. Furthermore, the songs just seemed to lack energy, and the band were just going through the motions on stage. Inkubus Sukkubus were kind of average. Strangely for a headliner, they were blighted by poor sound, which didn't help. 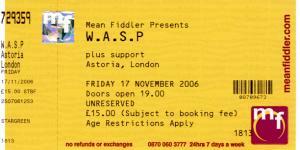 Even more strange, the other bands on the bill had been blessed with quite reasonable sound. Highlights were "Belladonna & Aconite" and "Paint it black", but they've been better in the past. 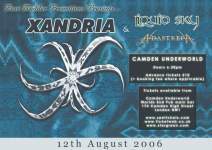 The obvious focal point of openers Adastreia are the outstanding operatic vocals. The band got off to a bit of a shaky start, but seemed to get into their stride a bit as the set progressed. They're obviously inexperienced in a live setting, and showed little or no on stage movement. There was virtually no evidence of their claims to be a black metal band, but that aside, there's enough promise there that I'll be keeping an eye on them in the future. Things weren't looking hopeful for Forever Never. They had a vocal fan in the audience wearing a Korn T-shirt. Never a good sign. And my fears were justified when they took to the stage. True, there was the occasional rise above tedium, but mostly it was just shouted vocals, and an absence of melody. Very poor. Season's End never seem to disappoint, and tonight was no exception. That said, they weren't on absolute top form tonight, and Dave's vocals seemed a bit strained. The set list consisted of all the regulars to which we've become accustomed, plus 3 new tracks. Best on stage quote came from Becki, who after getting tongue tied with the name of the support band and calling them "Never Forever" came out with this gem: "Bloody hell. Put a blonde in front of a microphone and see what happens! I'll stick to singing." Another strong showing from Season's End, then, and one from Adastreia showing the potential to go on to bigger and better things. I'd been less than impressed when I'd seen Humanity in the past. Tonight, however, they were a completely different band. 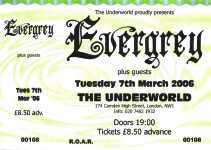 I'd never really noticed that they had any similarity to Evergrey before, but tonight it was here in buckets. Not only that, but it was accompanied by a hunger I haven't seen previously in the band. They were playing on top form tonight, and really put on an excellent show, one that was a marked improvement on their previous performances. Let's hope that they continue that trend. 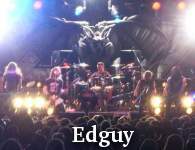 Evergrey had impressed me at Bloodstock a few years back, so they had a lot to live up to here. Fortunately, they didn't disappoint, and put on a near flawless display of prog/power metal. Highlights for me were "More than ever", and "I'm sorry" with main man Thomas Englund letting the crowd do the singing. The encore brought the night to a fitting end with performances of "Recreation day", "A touch of blessing" and "The masterplan". 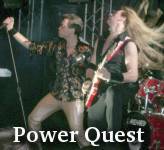 Having been impressed with Power Quest at Bloodstock a few years ago, I was looking forward to seeing them again. Sadly I was somewhat disappointed by their performance tonight. True, they were hampered by terrible sound. But Alessio's diction was poor as well, and the band have definitely been better in the past. 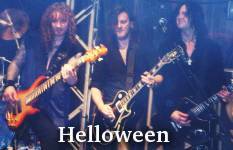 As I predicted, Helloween have struggled after the departure of Uli Kusch and Roland Grapow. That said, they've done reasonably well with their latest "Keeper of the seven keys" album. It's not up to the standards of the classic Keeper 1 and 2 albums, but it's a step up from their previous album "Rabbit don't come easy". Indeed, some of tonight's best tracks were from the latest album, such as "Occasion Avenue" and "King for 1000 years". "Future world", "Dr. Stein" and "If I could fly" were also good. However, "I live for your pain" was very poor, and the Dani Loeble's drum solo was too long. A bit of a mixed bag, then, but overall a good show. Crimson tears had a terrible mix initially. It improved throughout their set, but was never great. The singer seemed more confident on stage this time. However, the band were playing out of time, and the singer was out of tune. Neither of those were conduicive to a good show. The set ended with a cover of Iron Maiden's "Moonchild". 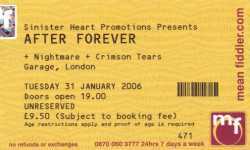 Nightmare were fairly generic power metal, but reasonable enough with it. They need a bit more imagination, and they might be able to rise above their current mediocrity. Their singer sounds familiar, but I can't quite place where I've heard his voice before. 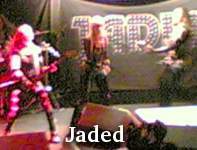 Their set included another Maiden cover, this time "Aces high". 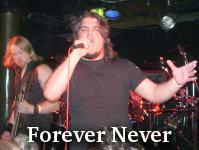 After Forever were very polished, just as they were at Bloodstock. However, the vocals weren't clear, and I found myself straining to hear the lyrics. I enjoyed "My pledge of allegiance, part 1", a cover of Metallica's "For whom the bell tolls" and "Forlorn hope". They even played a snippet of the Kiss disco classic "I was made for loving you". All three bands this evening played an Iron Maiden cover, After Forever going for "The evil that men do". Not a bad show, but not a great one, and I found myself being disappointed by the reliance on backing tapes for the choral effects. The Answer came across as a bluesy mixture of Led Zeppelin and Thunder. Nothing outstanding, but a fitting opening band for Deep Purple. I'd never seen Purple before, but they've certainly aged well. 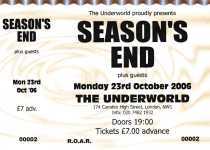 Of the classic lineup, only Gillan, Glover and Paice remain. Don Airey has replaced Jon Lord on keyboards, and Steve Morse was doing a decent job of filling Blackmore's shoes. The band would normally be found in much larger venues, so when the opportunity arose to see them at The Astoria, I thought it worth a go. The backdrop was notable for featuring several computer controlled sparse arrays of LEDs, which were displaying a range of pattens and images throughout the show. Musically, the band were good, and it was nice to see they weren't resting on their laurels, and that even though I wasn't familiar with their the new material, it stood up well to the classics. The highlights included "Ted the mechanic", "Highway star" and "Black night" as an encore. Sadly, there was no "Child in time", though.